AMPLIFICATORE COMBO PER BASSO 1x12' 100W La nuovissima serie Rumble rappresenta un considerevole passo avanti nell'evoluzione degli amplificatori portatili per basso. I nuovi amplificatori Rumble, completamente riprogettati, sono notevolmente pi� leggeri ed energici dei loro predecessori, con persino maggiore potenza e la classica vibrazione Fender. Un circuito overdrive con interruttore a pedale di recente progettazione, una versatile palette sonora a tre pulsanti e un cono Eminence� perfezionato offrono timbriche potenti ideali per qualsiasi concerto. 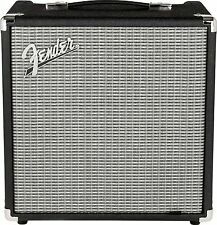 FENDER RUMBLE 100 W BLK AMPLIFICATORE COMBO PER BASSO NUOVO. 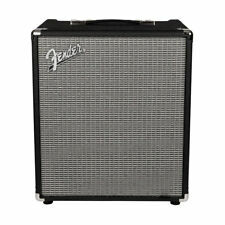 Fender rumble 100 watt RMS. 1x 12" Fender Special Design speaker. Power: 100 W. Weight: 9.97 kg. Line out XLR with Ground Lift. Mini jack stereo AUX input. Il Combo di basso Fender Rumble 100 (V3) batte classico Fender sguardi e tono. Fender Rumble 100 Combo basso (V3) (nuovo). Fender Rumble 100 caratteristiche principali di Combo per basso (V3). Serie: Rumble ™. La toute nouvelle série Rumble constitue un fantastique bond en avant dans l'évolution des amplis basse portables. 1 haut-parleur de 12" Special Design Eminence® sous 8 ohms, 50 Watts, p/n 0071298000. Condition is New. I had ambitions of learning how to play the bass guitar but it is too heavy around my neck so I am not pursuing that any more. Speaker: 1x12" Eminence Special Design. Power: 100W. Weight: 22 lb. Ted Brown Music has been serving the needs of musicians for over 80 years! If you want plenty of power but don't want to drag a tonne of gear with you then this could be the answer. 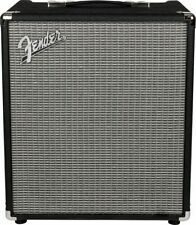 The Fender Rumble 100 V3 is a modern bass amp with a huge range of excellent sounds. At just under 10 kilograms it won't break your back either. 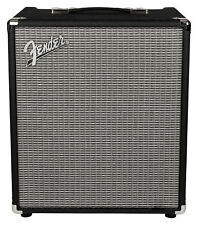 Fender Rumble 100 (V3) Bass Combo Main Features. Re-engineered from the ground up, The Rumble 100 combo is lighter and louder than ever, with even more power and a classic Fender vibe. Series: Rumble™. Inputs: One - 1/4". Amplifier Type: Class-D. GAK Saving: % OFF. RRP £ 0.00. Code: 8470. All Categories. Amplifiers > Bass Amplifiers > Bass Combos. By building in all the essentials then holding the line on price, they've made it accessible to most anyone. The ported bass design holds a 15" special driver and horn driven by a 100W amp. 15" special driver and piezo horn. Fender Rumble 100 1x12 Bass Combo Amp Replacement Grill Cloth 14.75"x 16.75"
Tone House Studios has new Guitar and Recording Studio gear being added every week! recording facility located in Long Island, NY. Many issues can be solved quickly and efficiently with quick correspondence. This genuine Fender amp cover has been recently introduced and designed to fit over and protect a Rumble 100 bass amp. One of the features is an embroidered logo. The cover is heavy polyester canvas material with nicely finished edges and an ample slot in the top for the amp's handle. Black nylon cover designed to fit the Fender Rumble 100 V3 amplifier. NEW - GENUINE FENDER AMP COVER. Other alphabets (Cyrillic, Japanese, Chinese, etc.) will not be translated and your item will be delayed. This is a quality heavy duty vinyl protective cover for a Fender Rumble 60 1x12 bass combo guitar amplifier. Each cover is made specifically for the amp listed and has properly positioned handle opening(s).